Save time and frustration by keeping all your chemicals and accessories in this premium belt! The FLEX Auto Detailing Belt, by Detailer’s Helper, is an ingeniously designed auto detailing belt that’s constructed entirely out of paint-safe materials. The FLEX Auto Detailing Belt provides several perfectly-sized pockets for storing essential detailing tools like polishes and compounds, microfiber towels, foam and wool buffing pads, your cell phone (including iPhone 6 PLUS), masking tape, and more! 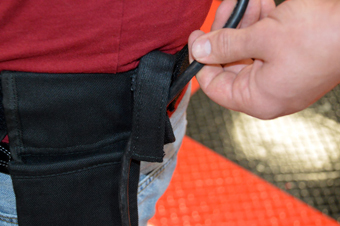 The FLEX Auto Detailing Belt even has a cord wrangler loop for attaching the power cord of your FLEX buffer, keeping it out of the way as you polish. 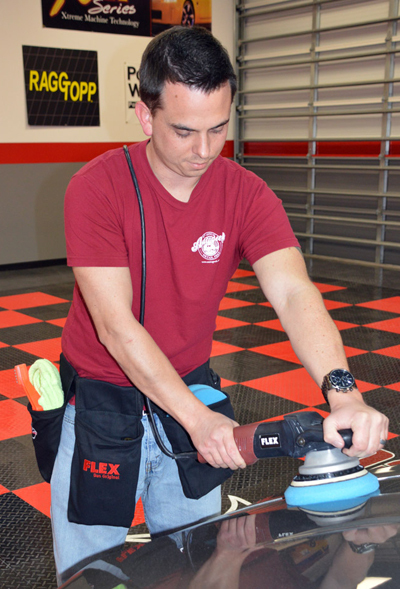 The FLEX Auto Detailing Belt is the next best thing to having Bob Eichelberg, the President of FLEX North America, standing by your side handing you bottles of polish, a Foam Pad Conditioning Brush, and other tools and accessories that you reach for during every detail. The FLEX Auto Detailing Belt keeps all your must-have products within easy reach! Not convinced? You should feel comfortable knowing the FLEX Auto Detailing Belt was designed by detailers for detailers! The FLEX Auto Detailing Belt is rugged enough to withstand daily use, and soft enough not to scratch delicate paint. Cord Wrangler Loop – To keep your buffer cord in place behind your back. Can also be used as a towel loop. Adjustable Belt – For waists up to 43", no plastic or metal buckles that can scratch paint. Car-Paint-Friendly Soft Cotton Fabric – FLEX Auto Detailing Belt was specifically designed to be paint-friendly, no metal, plastic, or harsh fabric has been used, so you can keep your paint scratch-free! Mix-and-Match – Each bag goes on individually, so you can mix and match to your perfect setup for that day’s job. Whether it’s one bag or all four, FLEX Auto Detailing Belt will help you get the job done better and faster! Machine Washable – It’s cotton, so you can wash it occasionally (on delicate/cold) when it gets really dirty. Light Weight – Unlike a large construction or leather belt, FLEX Auto Detailing Belt is light weight, you actually forget your wearing it! It weighs less than a pound! 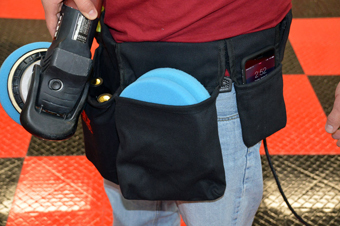 Holds pads, polish, your cell phone, and more! *Pictured pads and chemicals are not included. Mike Phillips' How to use the Flex XC3401 VRG Dual Action Orbital Polisher Paperback BookHow To Properly Use Flex Polishers DVDMike Phillips' The Complete Guide to a Show Car Shine Paperback BookMike Phillips' The Complete Guide to a Show Car Shine E-book - DownloadClub FLEX Intro Kit FREE SHIPPING! I ordered this some time ago, but haven't had the opportunity to put this to use until recently. It's easy to put on and the velcro feels strong enough to last long over time and able to endure the use which it's designed for, especially the frequent squatting, sitting, standing that I do detailing my car. The various pouches are very handy and roomy and they're not tightly looped to the belt. They slide off very easily and quickly as needed. After wearing it for a few minutes, it felt comfortable and wasn't cumbersome to wear. I had one bottle of Wolfgang Polishing Enhancer in one pouch, a bottle of Wolfgang Finishing Glaze in another pouch and my drinking water bottle in back. The belt didn't slide off my waist or slip all that much. Overall, I'm very pleased with this belt. ProsRoomy and easily adjustable pouches. Easy re-arrangement of pouches as needed. Handy loop in back for electrical cords when using a polisher. Durable and well-made.